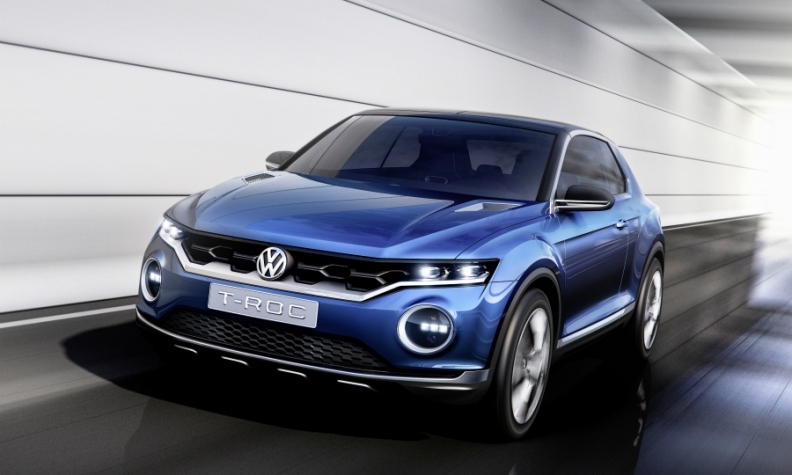 VW is expanding its SUV lineup in China with SUV/crossover models including the T-Roc, shown. BEIJING -- Volkswagen brand is launching a strategic plan for China focused on SUVs, full online connectivity and low-emission vehicles to bolster the brand and defend its lead in the lucrative market. Every second VW sold around the world is delivered to a customer in China, making it the brand's greatest strength but also leading to a dependence. It controls 13.2 percent of the market via two joint ventures and sold more cars there in the month of December alone than it did in the UK and France combined during all of last year. A prolonged slowdown in overall demand or a lack of competitive products could have a severe effect on the brand's global volumes and by extension its parent, VW Group. The group's share of its overall JV profits, including the VW brand, slid 4.2 percent to 4.75 billion euros last year as Audi struggled to overcome a dispute with its FAW-Volkswagen dealers. During the Beijing auto show last week, VW brand sales chief Juergen Stackmann told Automotive News Europe the Moving Forward initiative that started last month is designed to ensure the company remains at the top of a quickly shifting market. He cited as one example of the risks the Geely brand, owned by Li Shufu, the same auto tycoon that recently bought a stake in Daimler. Geely came out of nowhere to overtake all other competitors, most recently Honda, to grab the number two slot with a 6 percent share thanks to entry level crossovers priced below 100,000 renminbi (about 13,000 euros). In 2010 Geely hadn't even counted among the top eight brands in the country. Moreover, VW also suffers from a sort of multiple personality problem in the marketplace: its brand is perceived differently due to its joint ventures, which sell their own unique models via separate distribution channels that compete with each other. "If you asked people about the VW brand in China you got three different answers: there was SAIC-Volkswagen, FAW-Volkswagen and Volkswagen import. we want the brand to be seen once again as the whole," said Stackmann, adding there is no concrete volume or share target. One symbolic step of the Moving Forward plan was convincing both FAW-Volkswagen and SAIC-Volkswagen to set aside their rivalry and participate in one joint overarching VW brand trade show stand during Auto China. "Even if they are united via Volkswagen, they are major competitors, each with 1,000 dealers. That's one of the unique characteristics of the Chinese market," Stackmann said. VW's northern joint venture, FAW-VW, builds and sells cars such as the U.S. Jetta sedan marketed as the Sagitar in China. The southern SAIC-VW joint venture offers a different lineup, including VW's best-selling local model, the Lavida sedan. Leading the effort in China is Stephan Woellenstein, appointed to the new position of CEO of Volkswagen Brand China in 2016 to elevate the importance of the country and give it greater regional focus. He is one of the few managers in China with sales experience in both of VW’s joint ventures, FAW-Volkswagen and SAIC-Volkswagen. Previously there was only a national sales chief that reported to the VW Group head of China, Jochem Heizmann. Last year VW set an industry record by becoming the first single brand to sell more than 3 million cars in a single country during a single calendar year, Woellenstein told reporters. Although Volkswagen showed off two new sedans at the Beijing show with the CC, called the Arteon in Europe, and a new Lavida, it is really banking on a greater mix of SUVs. Currently the brand only sells three such model lines — the Tiguan, mainly in the long wheelbase version, the midsize Teramont and the imported Touareg — but this will double by the end of this year. FAW-VW will get its first crossover with the T-Roc as well as its second in the fourth quarter, a coupe-styled offroader currently called the "Advanced Mid-Size SUV." The sixth, a compact currently called internally the "Volks-SUV", will be built by SAIC-VW before the end of the year. These six will then double to 12 in two years' time, according to Woellenstein, by which point a third of all VW brand vehicles sold in China will be SUVs. Other major aspects of the plan include a major rollout of plug-in hybrid and battery electric cars with a total of 10 new vehicles based on combustion engine cars by 2020. Afterwards a further 10 will come, based off its purpose-built electric car architecture called MEB. VW also aims to equip all its models by the end of this year with online capability. According to VW, China’s WeChat counts 800 million monthly users, 50 percent of which spend 90 minutes every day on Tencent's hugely popular social media app. Currently only a few imported cars including the Touareg or eGolf offer online connectivity built into the car, whereas none of the JV cars do. Only an aftermarket solution such as a dongle with its own separate SIM card can be used currently to access the internet. Woellenstein therefore is more optimistic about next year's sales. "We see moderate growth in 2018, but the real jump should occur in 2019 when the Tiguan plug-in hybrid, Volks-SUV and T-Roc are available for a full year," he said.